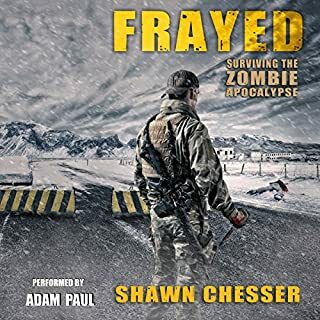 In Harm's Way, book three in the Surviving the Zombie Apocalypse series, picks up on day eight where Soldier On: Surviving the Zombie Apocalypse left off. Meanwhile, Duncan Winters, Vietnam-era aviator, finds himself stranded in Springs along with BLM firefighter Daymon Bush. Both men arrived with Cade and were promised transport back to Eden, Utah. 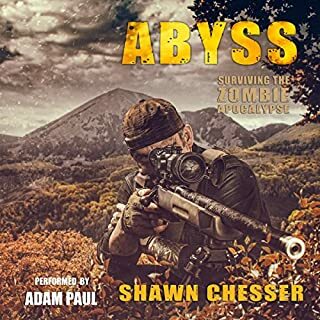 Duncan longs to be reunited in Eden with his brother, Logan, a survivalist/Doomsday prepper. 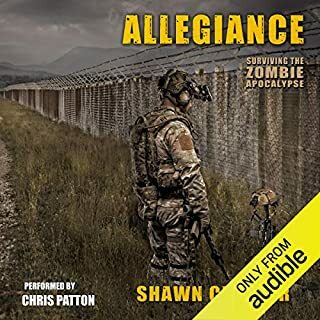 Daymon, with no surviving family, knows only one thing for certain: he doesn't want to remain trapped behind the wire inside of a huge government-run military base. 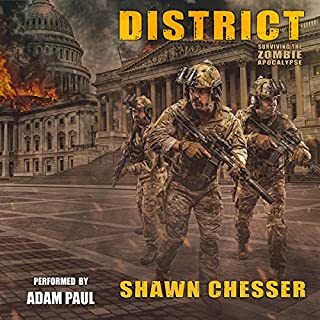 Mere days after Washington, D.C., is overrun and the sitting president goes missing, Robert Christian, billionaire kingmaker who has been waiting in the wings for a world-changing event such as this, marshals his group of mercenaries led by former Navy SEAL Ian Bishop. Their mission: to control what remains of the United States by any means necessary and ultimately reshape the country to fit their warped vision for a new world order. 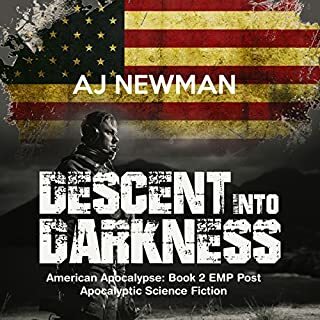 Will Cade accept President Clay's overture and embark on a new high priority mission alongside his friend and mentor, Delta Commander General Mike Desantos? 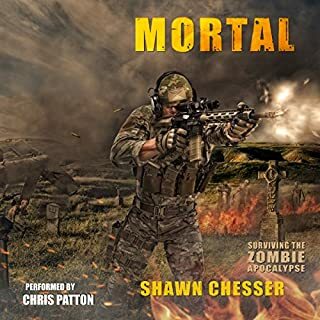 Will Brook Grayson continue to hone her newly found survival skills and successfully train her 11-year-old daughter, Raven, to defend herself against the undead threat? An offspeed pitch, but still great. 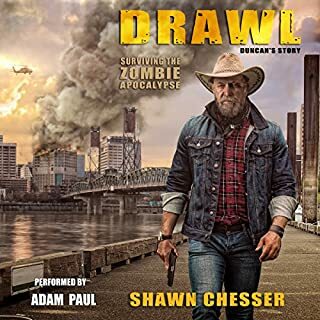 Starting 8 days after the original outbreak happened, In Harm's Way finds Cade Grayson safe with his family -- for the time being. 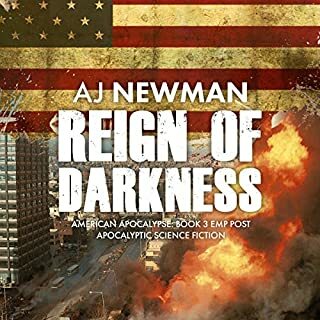 He's elected to "re-up" to help his brothers-in-arms to defeat the enemies of the state... both zombies and others. 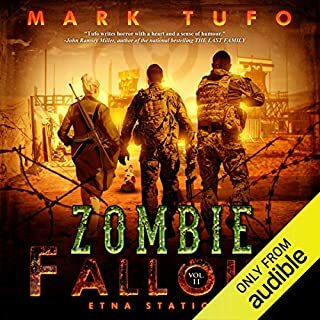 The narration for this and both other books was done by Chris Patton. Like the other 2, the narration in this was perfect. He is the perfect voice for Cade and the other characters that are involved in all the books. Patton does a superb job keeping up with the pacing of the book, speeding up when he needs to and taking it a little slower when it's called for. 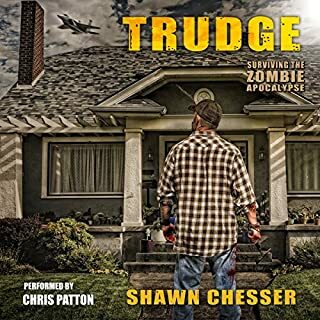 The first two books in the Surviving The Zombie Apocalypse series: Trudge and Soldier On were both action throughout -- Trudge needed some set up in the beginning but then quickly sped up. 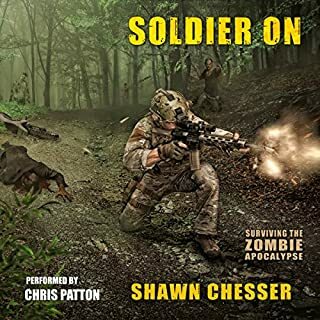 Soldier On was beginning to end action with a lot happening to move the story forward. 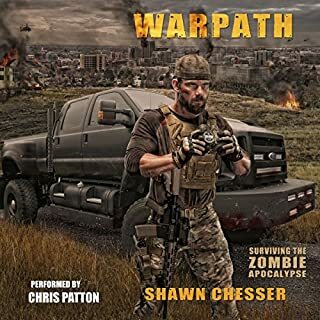 With In Harm's Way, I could tell that Chesser was looking for a way to explain what was going to happen in the next books and with the series. Technically it could have ended in book 2 with a relatively happy ending, but to continue he needed to turn the story a bit. I think that's what is happening with book 3. Don't get me wrong, In Harm's way is still a great post-apocalyptic/zombie novel, it was just a total off-speed pitch in comparison to the other two. I 100% understand why Chesser did what he did and I don't fault him for it at all. Unfortunately, I can't really talk about the choices that he made to continue the story because it will involve major spoilers. Let's just say I can't wait to see what happens in book 4. Some of the technology that is included really peaked my interest. I'm sure that there either is something like what he described today, and if it's not I'm betting it's in the pipeline for the near future. The characters are incredibly well described, and some of the new ones gave me chills when certain things happened. (It's really hard not to give away too much). 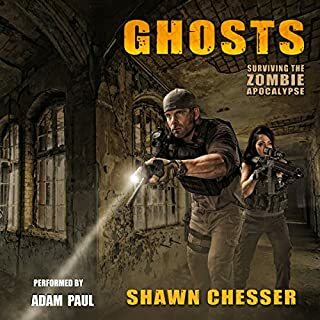 I am eagerly awaiting for Chesser and Patton to team up for the rest of the series because I need to figure out what happens to Cade, his family, and the others. Day 8 of the zombie apocalypse. There is no cure. There is little to no chance that anyone who has made it just over a week will continue to live for much longer. 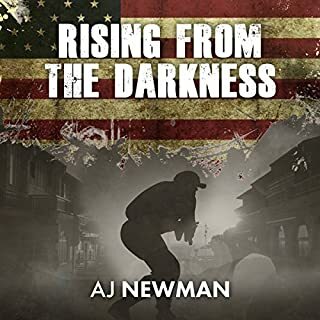 Cade Grayson has been reunited with his wife and daughter just in time for the new President to ask Cade to re-up to help fight against the new enemies of the state – the zombies and others. 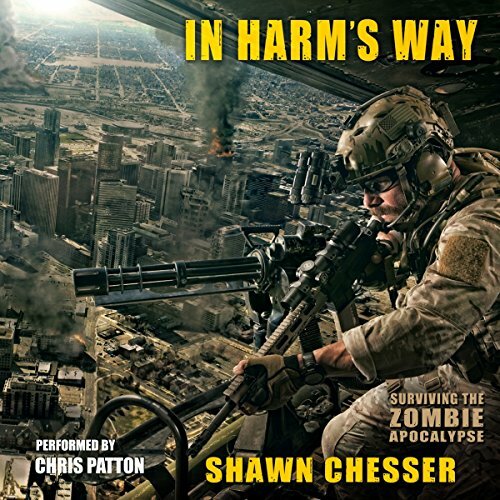 Narration for In Harm’s Way was done by Chris Patton. If you are familiar with the series, you know that Patton has narrated the other two books in this series too. He is the perfect voice for Cade and the other characters. A little raspy and manly, the voice fits Cade’s character perfectly. The production quality was perfect; I didn’t notice any issues or problems with speed or anything else. While this change in speed wasn’t expected by me, I still really enjoyed the story the Chesser wrote. The direction he is taking this series makes me happy and I think that book 4 will be right back at the bang-bang-bang speed that I was used to. 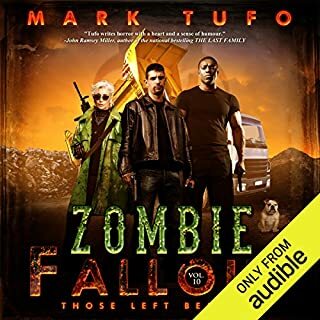 Overall, this was still a great zombie book – just be prepared for a slight slowdown. Chesser finds a way with every book to leave me begging for more, and he’s done it again. Last few chapters show promise. Much the same as other series in this genre. 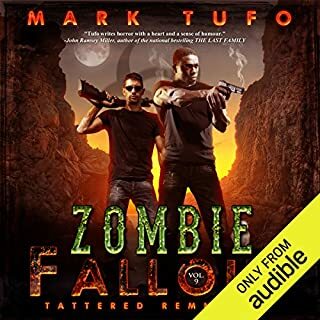 We have at least three sets of survivors to follow around as they make their way to safety, other family members, or the military fighting the undead due to the Omega virus. As was the previous volumes this book is a little long-of-tooth in the story telling department. Although the last few chapters did improve and show promise. As I said of book two the story is not terrible, it's just a bit tedious at times and perhaps could be reduced in volume somewhat. Again three.point.five for the effort. This series is very entertaining and I enjoyed the story very much!! I hope a certain someone gets killed soon! I loved this story when I read it first! 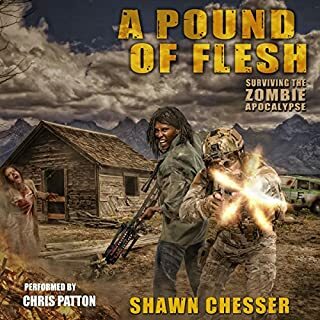 Chris Patton made it amazing again! 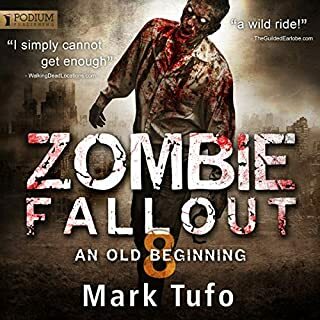 A fantastic series part 3....I enjoyed the familiarity the author had with military procedures and the like...top shelf zombie series... I will buy all remaining books!